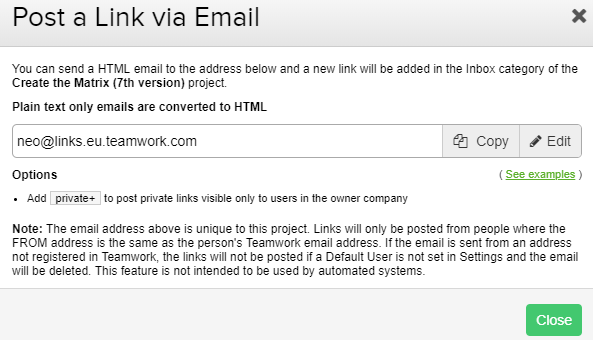 Within Teamwork Projects, you can you can add links to your projects via email. To access the email address for posting links to the project, go to the Links area of your project. From here, click the options (three dots) button to the top right corner, and select Post a link via email from the dropdown. You will be able to edit or copy the email address that you can use. To post a link, create an email, with the address you found following the information above. The title of the link goes in the subject line, and the link URL in the body to create a link in the project. You can also include [#categoryname] in the subject line to choose or create a new category for the link.